Served with coleslaw or cottage cheese, buttered marble rye bread and your choice of potato: French fries, potato salad, German potato salad, sweet potato fries, half and half or baked potato. 3.99 Add nacho cheese sauce on the side for 1.00 more. We proudly get our burgers from Townline Market, where they are always fresh and NEVER frozen. Our 1/2 lb. burgers are served with chips and pickles. Add potato salad, pub fries, sweet potato fries or go half and half instead of chips for 1.00 extra. Add onion rings for 2.00 extra. 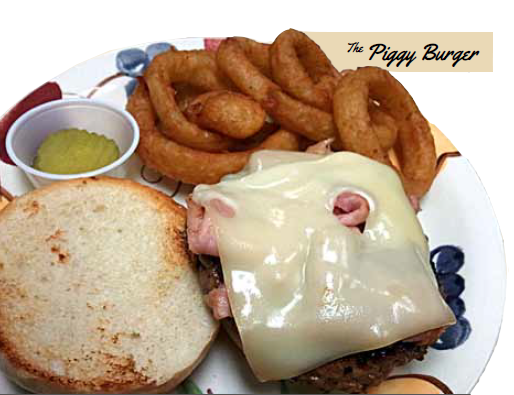 Topped with melted American & Swiss cheese then smothered in fried onions all served on marble rye. 6.99 Thousand Island upon request. * Whether dining out or preparing food at home, consuming raw or undercooked meats, poultry, seafood, shellfish or eggs may increase your risk of foodborne illness.